With a white mom and a black dad, Nina Armstrong was raised to see the world through non-colored eyes. “There is no race,” her parents would tell her. Even her mocha-colored skin, ringed hair with tinges of red, and her easy friendships with a variety of girls reflected her wide-open view of the world. But then her parents divorced, and Nina’s world was divided into black and white—literally. When racial tensions flare up soon afterwards in her hometown, suddenly everything is about race. Fifteen-year old Nina is torn between two homes and two cultures. High school is tough enough without adding racial and family issues to the complexities of friendship, cliques, and the inner search for identity. Nina feels abandoned by both parents, who are caught up in either recovering from the divorce or moving on from it, and now by friends who previously had never made an issue of being white or black. Which is she? One, or the other—or both? Feeling rejected by both sides, Nina turns to the recently discovered story of her great-great-grandmother Sarah, who escaped from slavery in the 1850s. Through her father’s manuscript about Sarah, Nina finds someone who experienced the rejection and searching she herself is going through. But in Sarah, Nina finds so much more. When she can’t handle her life anymore and decides to run away, only Sarah’s words can reach her heart and give her much-needed perspective on what is truly important. Almost every teenager goes through a period of self-discovery, some with more drama than others. 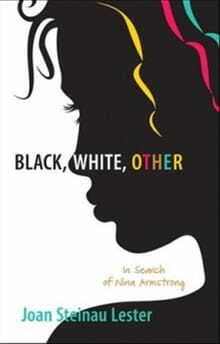 Joan Steinau Lester tells a compelling story of teen angst, a search for self-identity and personal independence, but with a racial twist. Nina screams at her mom, tells off her dad, and argues with her little brother like a typical teenager. She suffers when her long-time friends slight her and new friendships threaten to replace her. She’s obnoxiously normal. But her biracial identity adds to her stress, bringing unique challenges her way that virtually no one knows how to help with. Interspersed throughout Nina’s story, it is Sarah’s narrative that shines. Nina seems to be something of a whiner. Though honestly confused by the way people are reacting to events around her and why she had to get caught up in all of their drama, she reacts immaturely until the final scenes. Teenagers will probably relate quite well with her inner conflict, but I preferred Sarah’s story. The slave girl faced trials, heartaches, and injustice that few today can imagine. Bluntly truthful, not hiding the horror and fear that a slave lived with daily, Lester paints a realistic picture of pre-Civil War life for a black person. But while Sarah dared to run toward a new life, Nina is running away from hers. Through a minor character, Lester reminds the reader that slavery in America still thrives, but the captives aren’t black cotton pickers anymore. They are foreign girls (and others like them), sold to brothels or rich homes in exchange for their lives. Injustice lives and it is colorblind.